I have written a few lines about Bibi Punjab Kaur, wife of Ram Rai somewhere on this website. Ram Rai was son of the seventh Guru, Sri Guru Har Rai Sahib Ji, and the elder brother of the eighth Guru, Sri Guru Harkrishan Sahib Ji. I visited Dehra of Ram Rai (locally it is known as ‘Darbar Sri Guru Ram Rai’) in Dehradun (Uttrakhand, India) for many times. I went there for the first time with my mother and father during our journey of hill stations. I was merely a child at that time. When I lived in Dehradun, I would often visit the Dehra. It was not because it belonged to Ram Rai, but because it was the place where my King of kings, Sri Guru Gobind Rai Sahib Ji (Sri Guru Gobind Singh Ji’s early name) once visited and spent a few nights here. Moreover, for me and other students studying there in Dehradun, ‘Dehra’ was like a picnic spot as well. I was aware of history of Ram Rai, but never realised the role of Bibi Punjab Kaur. She was one of four wives of Ram Rai. That was all I knew about her. Time continued to fly. I could not go to Dehradun for 14-15 years. During these years, I studied Guru-history very attentively. I realised that it was not fare to portray her as merely one of four wives of Ram Rai. I realised that she was daughter-in-law (Bhateej-Noonh or wife of nephew) of my King of kings, Sri Guru Gobind Singh Sahib. (In worldly relation, Ram Rai was ‘Bhateeja’ or nephew of Sri Guru Gobind Singh Sahib. Father of Sri Guru Gobind Singh Ji and grand-father of Ram Rai were real brothers. The wife of nephew is called ‘Bhateej-Noonh’). But, her relation with Guru Gobind Singh Sahib was not merely that of father-in-law and daughter-in-law (Bhattej-Noonh). When we analyse Guru-history, we come to know that she became a devotee of Guru Gobind Singh. That is why she started to recite the ‘Ardaas’ (prayer), as told by Sri Guru Gobind Singh Ji. Now, when her portrait in my mind was changed a lot, I wanted to visit her ‘Samadhi’ or ‘Dehra’ again. My visit would be different now. I used to visit ‘Samadhi’ of one of four wives of Ram Rai. Now I wanted to visit ‘Samadhi’ of a devout ‘Bhateej-Noonh’ or daughter-in-law of Guru Gobind Singh Sahib. (More words are needed to describe my feelings. I will try to explain this in future). ‘Dehra’ of Bibi Punjab Kaur is situated in Darbar Ram Rai complex. The ‘Dehra’ of Ram Rai is built in the middle of the complex. On all the four corners of Dehra of Ram Rai (called ‘Darbar’ of Ram Rai), Dehras of his four wives are constructed. (Interestingly, Dehra of Bibi Raj Kaur, the eldest wife of Ram Rai, is also constructed, though she died in Manimajra, where her last rituals were performed). 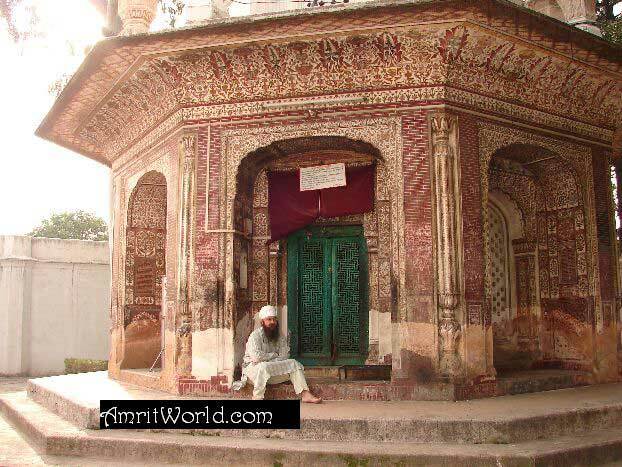 The ‘Dehra’ of Bibi Punjab Kaur is situated on the right corner in front of Dehra of Ram Rai. The construction of Bibi Punjab Kaur’s Dehra was completed on Friday, Assu Sudi 10, Samvat 1868 Vikrami (year of 1811). The ‘Dehra’ of Bibi Punjab Kaur, like other Dehras of the complex, is built in Mogul style. 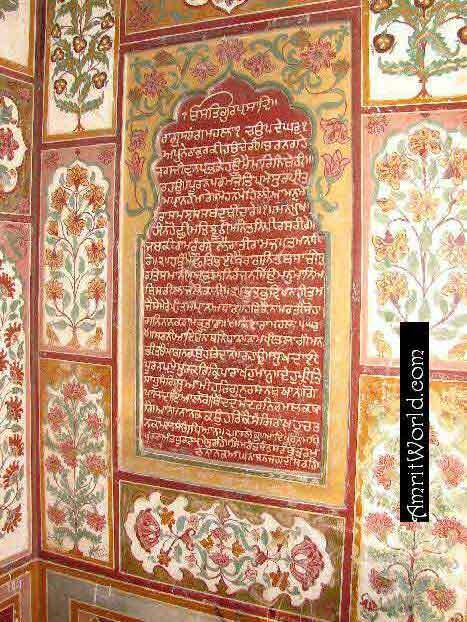 A few holy hymns of Sri Guru Granth Sahib Ji are engraved on walls of the Dehra. This entry was posted in English Articles on January 25, 2009 by admin.